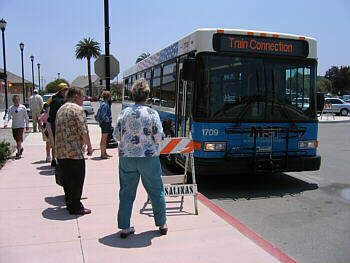 The day the DMU came to Salinas. 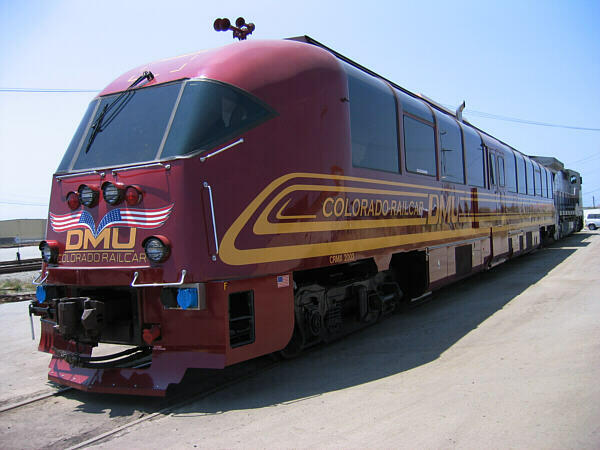 Important Note: Colorado Railcar, manufacturer of the DMU, went out of business in late 2008. I decided to keep the article in the Del Monte Club Car for now. The story of the crowds drawn by a simple railcar shows, better than anything I can say, just how much the public would like to see intercity rail service restored to Monterey County. What the heck is a DMU? DMU stands for Diesel Multiple Unit, a fancy name for a self-propelled railcar. 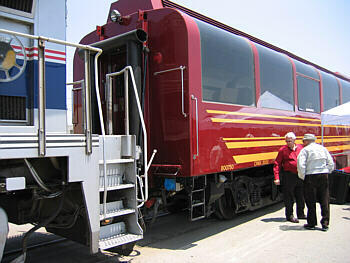 The concept is not new, as the Budd company built something similar, called the RDC, many decades ago. The RDCs were awkward looking, but functional vehicles, best suited to short feeder lines. The new Colorado Railcar DMU revives the RDC concept in a modern, powerful, fuel efficient package. Unlike the RDC, the DMU can easily pull two additional railcars. For a short passenger train it is cleaner, quieter, and more fuel efficient than a similarly sized train pulled by a conventional locomotive. TAMC planners think it may be just the thing for the Del Monte service between the Monterey Peninsula and San Francisco. 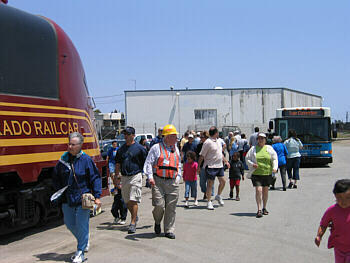 The demonstration was sponsored by the Transportation Agency for Monterey County (TAMC) with the cooperation of Union Pacific. 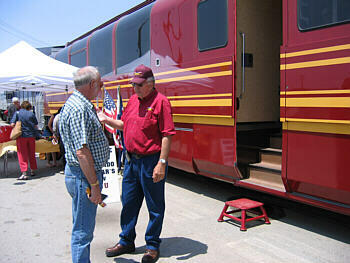 Representatives from TAMC and Colorado Railcars were on hand to answer questions. The DMU was parked on the east side of the Union Pacific freight yard opposite the Amtrak station. An MST bus provided shuttle service between the station 's parking lot and the DMU display. ....and took us to the DMU over here. The event was very well attended. The shuttle ran every 10-15 minutes and every single bus I saw was packed full. Bill Reichmuth, Executive Director of TAMC, indicated that when the event opened at 11:00am, over 200 people were waiting in line. 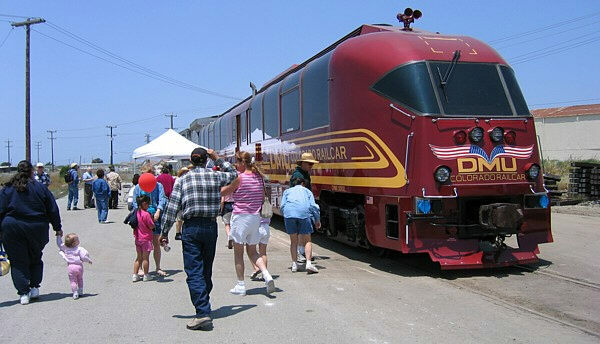 The DMU which came to Salinas was the prototype built by Colorado Railcar Company (CRC). it can be built to order in a variety of configurations. This model contained samples of three types of seating that are available, and many other configurations are also possible. 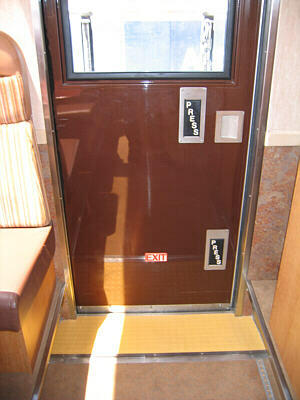 A center vestibule, with an optional wheelchair lift, divides the car into two sections. I visited the forward section first. 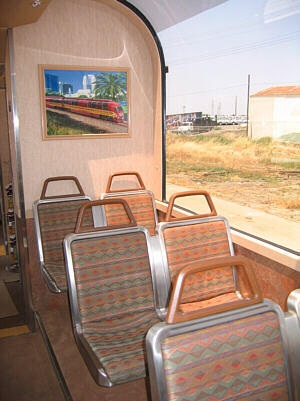 In the above photo we can see the "Standard Transit" style seating in the foreground. 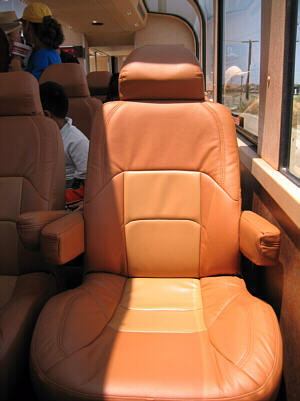 These are basically bus seats. They might be adequate for short-line commuter service, but would be uncomfortable for a trip as far as San Francisco. Towards the front are the "First Class" seats, which feature plush leather upholstery, reclining backs and movable arm and head rests. These proved to be very popular with the people around me. I found them to be very comfortable, myself. Below are close ups of these two seat styles. 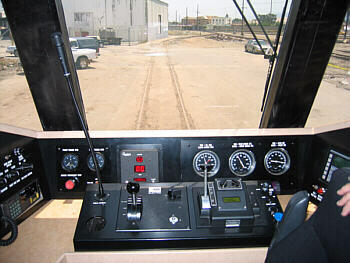 Next I visited the cab and had talked with the engineer about the DMU's mechanical and performance characteristics. First, I was concerned that the engines, being located directly under the passenger compartment, might cause a lot of interior noise and vibration. But he said they had done such a good job of insulating that one might only feel a slight tingle in the toes while standing in the aisle when the train is under power. Noise wasn't a problem, he said, and was generally noticeable only when climbing a grade. Even then it was not enough to disrupt anyone's conversations. I also asked him about the DMU's reliability. After all, this was the only DMU yet in existence, it didn't have much of a track record yet. He replied that it had been running all over the country for almost a year and a half and hadn't encountered any significant problems. He then explained that most of the mechanical parts were off the shelf components that had already proven themselves in other vehicles. The "Detroit Diesel" engines are workhorses in the trucking industry, and parts can easily be obtained at any trucking supply shop. This makes them easy and economical to repair. The wheelsets, called "trucks" have been used reliably in other commuter railcars in service with Caltrain and many other transit agencies. Finally, someone asked him just how fast can it go? He said in regular service it can cruise at 90 mph, but that he had gotten it up to 110 mph on a test track. Unfortunately, due to track limitations, Union Pacific has set a speed limit of 70 mph for most of the line between Monterey County and San Jose. Track upgrades will be required to allow the DMU, or any passenger train for that matter, to achieve its full speed potential. 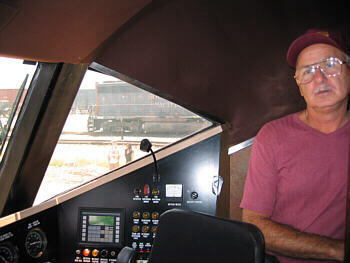 Next, I toured the rear half of the train. They called this type of seating "Business Class" but looked more like a food service area than anything. The seats were fairly comfortable, but firm. The seat backs offered good support. Outlets for laptops were available at the seats. A documentary video was playing at a small service counter. The rear half of the DMU with "Business Class" seating. The wraparound windows are optional. Conventional rectangular windows are also available. Personally, I like the open feeling of the wraparound glass, but at times the sun could be annoying. I think perhaps a Del Monte DMU should have a mixture of cars with both types of windows. 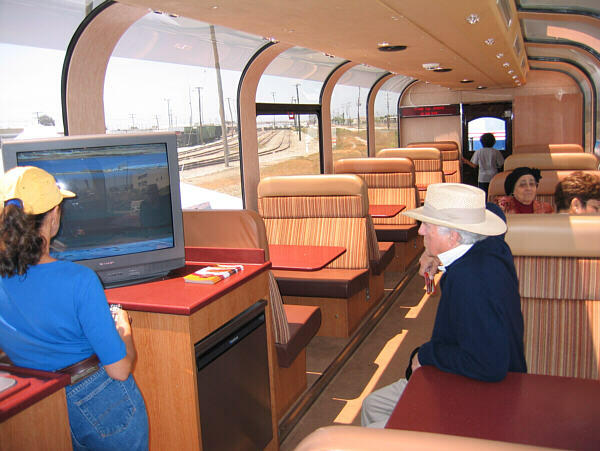 Perhaps, taking a cue from Amtrak Superliners, coach or business class cars could have standard windows, while a cafe/lounge car should have the wraparounds. 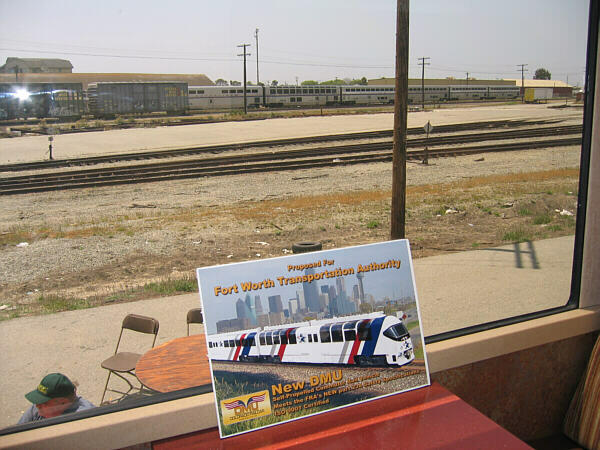 On the tables were displays showing how a DMU would look in the colors of different transit agencies around the country. In the background you can see Amtrak's train #11, the southbound Coast Starlight, stopped at the Salinas station. Near the middle of the car was a spacious wheelchair accessible rest room, directly across the aisle from a wheelchair tie-down space. I found the facility to be very well laid out, much like the rest rooms I remember from early Amtrak cars inherited from the "streamliner" era. 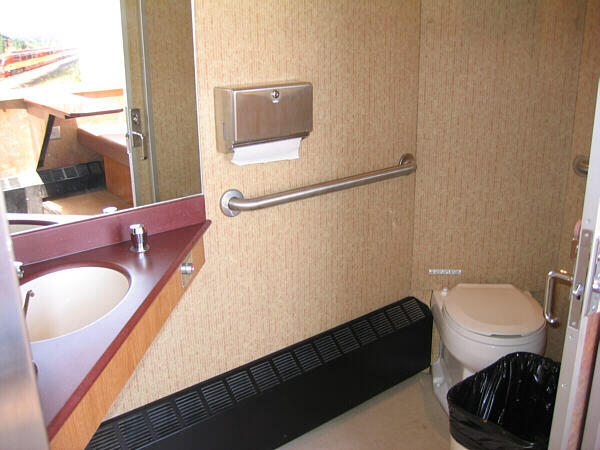 The wheelchair accessible rest room. This rest room is vastly superior to the rest rooms on Amtrak's Superliners. I told the CRC representatives that they could teach the Superliner designers a thing or two about rest room design and they all laughed! They said they learned a lot from Europeans. This concerned me a little. The floor of the DMU is slightly higher than a standard railcar to accommodate the engines below. However the door must be at standard height to allow the connection to another car. I found the step down to be rather abrupt, and could be a tripping hazard. The CRC representative said the slope could be made more gradual if so ordered by the buyer. I think that would be a good idea, as many people do not look at their feet when walking and could make a hazardous misstep when making the transition between cars. 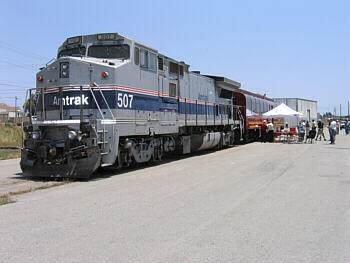 As a condition of displaying the DMU in Salinas, Union Pacific required that an Amtrak locomotive accompany it to Salinas. I guess they were worried that the DMU might break down or something. It also provided a forward facing cab for the return trip north. 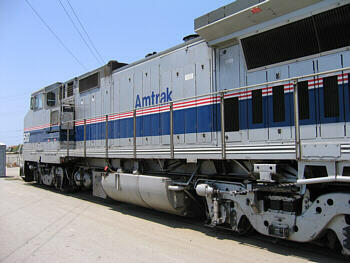 #507, an Amtrak Dash-8 locomotive, accompanied the DMU to Salinas per "Uncle Pete's" request. Colorado Railcar representatives in red shirts were on hand to answer any and all inquiries. I introduced myself to two TAMC officials I had not met before, and found my reputation preceded me. Upon hearing my name they cheerfully informed me that they were quite familiar with my website. My overall impression of the DMU was quite favorable, and others viewing the car seemed to agree. 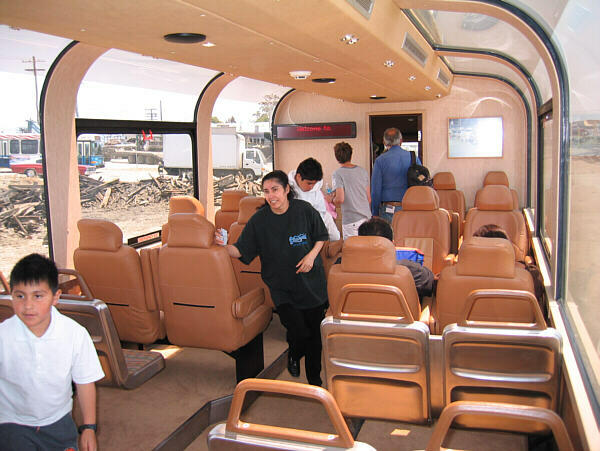 A three to five car train with comfortable seating and a food service car would provide a very attractive alternative to central California's urban and intercity freeway driving. I think the DMU is a serious candidate to provide the service. A full length view of the DMU. After visiting Salinas the DMU went on to Fullerton where Trainweb.com employees took a ride. Take a look at Trainweb's report here.